The Maintenance Department is responsible for the maintenance and servicing of 45 separate sites that contain 5,388,894 sq. ft. and are situated on 1,626 acres. The St. Johns County School District consists of 7 high schools, 7 middle schools, 3 K-8 schools, 18 elementary schools, 1 alternative school, 6 administrative facilities and 3 medical clinics. Our department currently has a total of 54 staff members. Our employees are made up of 10 technical crafts including carpenters, electricians, HVAC mechanics, mason, plumbers and other maintenance trade workers, along with administrative staff. David Lee is the Director of Maintenance, the Maintenance Department Staff can be reached at (904) 547-3707. During the 2015-2016 school year, in addition to performing preventative maintenance (PM) at each facility for a minimum two-week period, we process 3,805 routine and emergency work orders along with 293 capital improvement projects. 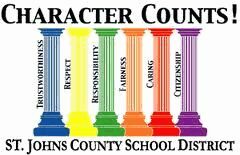 To support all students, faculty and staff of the St. Johns County School District by providing safe, clean and comfortable facilities through the performance of routine preventative maintenance, making required repairs in a timely manner and completing renovations as needed.